Sydney graduates in 4 days. I know, you are wondering if you read that correctly and you did! 4 days. She is ready to be done. I am not. Too bad for me. While she is getting ready to graduate, the rest of us are enjoying the activities and events that make up the end of the school year. May is a crazy month. I think it's crazier than December. Lacrosse season ended. It really ended a few weeks earlier for Gretchen because she got a stress fracture and has spent the month of May in a boot. Sydney loved her final season. Gretchen is looking forward to playing again next year. Prom was so fun for these two. They both thought their dates were great and their groups were fabulous. An excellent way to end for Sydney and an excellent way to begin for Gretchen. This picture makes me laugh a bit because as a reward for super hard work in our yard - they bought, loaded, unloaded and spread 47 bags of mulch, plus a couple other projects one Saturday - they all wanted a little cactus, please, please, please. Had I known $5 houseplants would bring me such happy cheerful yardworkers I would probably have houseplants coming out my ears. 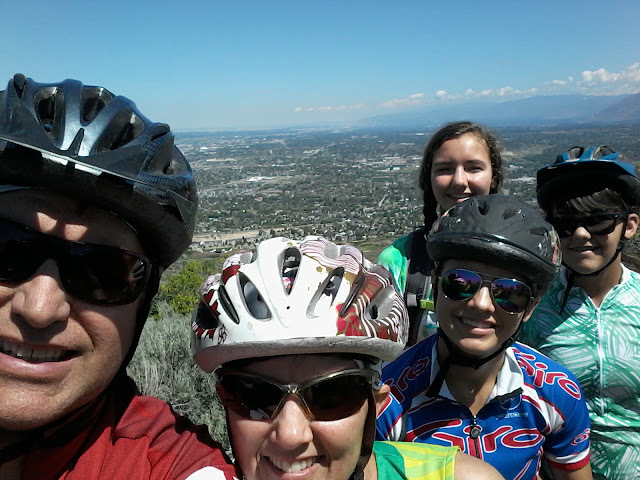 We went for an awesome mountain bike ride on my birthday. The weather was perfect, the scenery was gorgeous, the time together was the perfect gift. I like to make my own birthday cakes and this year I tried a recipe from Paula Deen for a coconut lime cake. So so yummy. I will be making that one again. Oh my gosh! Gretchen's hair looks adorable!